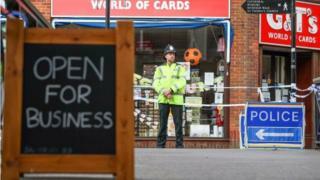 A nerve agent attack in Salisbury three months ago cost the police force £7.5m, according to the region's Police and Crime Commissioner (PCC). Former Russian spy Sergei Skripal and his daughter Yulia were poisoned in the city on 4 March. Wiltshire Police has also revealed Det Sgt Nick Bailey was contaminated at Mr Skripal's home in the city. DS Bailey, who was one of the first officers to attend the scene, was wearing a body camera and gloves. PCC Angus Macpherson described the police operation as a "massive effort" which involved 40 other UK forces. He said Wiltshire Police "came to the fore" with more than 140 officers on duty at the height of the operation. Revealing the financial costing, Mr Macpherson said the figure could still rise. He described it as a "national operation which must be paid for nationally". "I don't want anyone to forget the undertaking of policing minister Nick Hurd when he said [the government] would meet the costs," he said. Mr Macpherson also thanked the people of Salisbury "for showing their resilience" while investigation and decontamination work was carried out. Wiltshire Police Chief Constable Kier Pritchard described it as an "unprecedented incident" which saw "the very best of UK policing". Mr Skripal, 66, and his daughter, 33, were taken to Salisbury District Hospital after coming into contact with the military-grade nerve agent Novichok. Det Sgt Bailey was also admitted to hospital for treatment after being exposed. The Maltings shopping area where the Skripals were found unconscious was closed to allow extensive decontamination work to be carried out and reopened on 26 May. 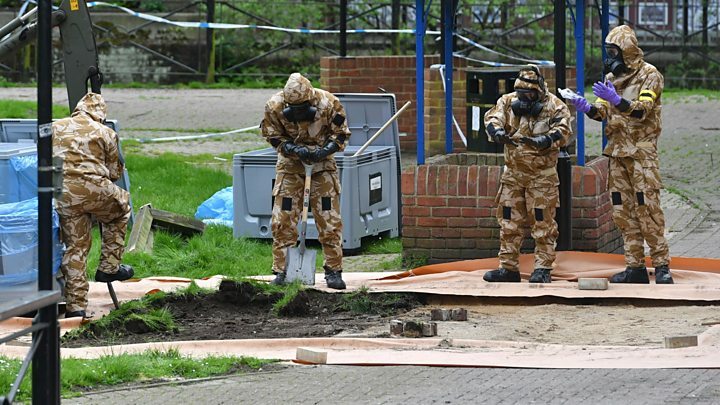 A Defra spokesman said security guards have started to replace the police officers deployed at some of the cordoned-off sites around Salisbury where clean-up work is taking place. Some £250,000 has been given to businesses in the city affected by the aftermath, some of which saw revenues drop by 80%. The government says Russia was behind the attack but Moscow denies any involvement.